A son needs his father. A country needs a hero. Europe is ablaze. America is undecided about joining the fight against Nazism. And James Zennor, a brilliant, troubled young Oxford Don is horrified. He returns one morning from rowing to discover that his wife has disappeared with their young son, leaving only a note declaring her continuing love. 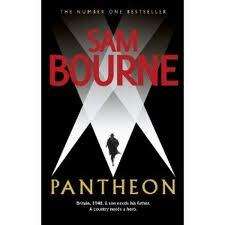 Pantheon had me gripped for its 400 pages in just two sittings over two nights. From the opening scenes I became lost in the vivid description as James Zennor is rowing, dealing with his shoulder injury from the Spanish conflict and reflecting on the loss of his best friend Harry in the same battle. But he continues to row, knowing that he must push himself, knowing that other men are fighting for their lives against Nazi forces to keep England safe for families like his. When he returns home to find his family have gone, leaving a simple ‘I Love You’ note the reasons for their disappearance begin to reveal themselves in the ugliest of possible scenarios as he is told by a family friend that his wartime nightmares have probably caused his wife Florence to flee and take their son Harry (named after his old friend) away from him. Although James knows that in a moment of madness he placed his two year old son at risk near a boiling kettle, the fact that he has woken screaming in the night and was found standing and holding a knife in the darkness is all terrifying news to him. Seeking the truth as to why they have gone and investigating where they may have fled to launches James on an adventure that takes him to underground passageways under libraries, to Liverpool, further afield on a ship bound for Canada and then on to Yale University to seek the truth. Along the way he is helped by some, delayed on purpose by others and realises that he is very much alone in his quest for reasons to be found. The wartime details in the novel all add to the experience and I was right alongside James throughout the book. Towns removing street and station name signs so as to totally confuse invading Nazis should they arrive was one such note, meaning that station staff then had to shout the name of the station to passengers on arriving trains. The nagging worry about just what is behind the transferring of a group of mothers and their children from Oxford to Yale is a dark and sinister premise and, though I had a reasonable idea fairly on as to what was likely to be going on, there were still more than sufficient fictional bombshells along the route to keep me entertained and, at times, open-mouthed in shock. Pantheon is a book with a horrible premise, events that ultimately affect whether or not America was to step in and help England in the war and provides the central character with a very tough judgement call to make as he gets closest to finding his family. The author’s notes at the end of the book make for additional fascinating reading and I was amazed at just how many of the events in the novel are so strongly based on fact – a close to the book that just added to how disturbing the central idea was. If you love a wartime based thriller, then Pantheon will certainly not disappoint. And if, like me, you are guilty of rarely picking one up, then you really should, as this is such a pacey, exciting and thrilling read.